Mr. Ron Dech (left), of Castle Air Conditioning & Heating, Easton, PA, accepts his prize winnings, as presented by Kevin Lesnewski, (right), Thermal Imaging Product Manager, Testo Inc., Sparta, NJ. 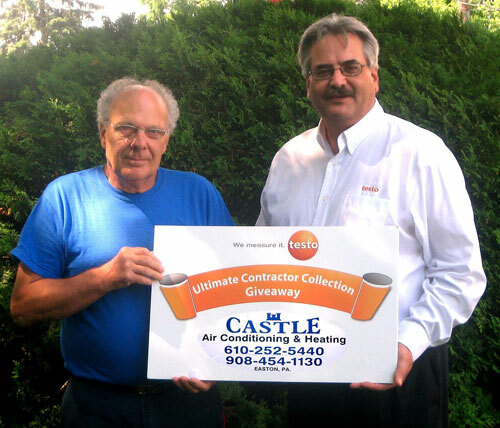 Sparta, NJ (June 28, 2013) – Mr. Ron Dech of Castle Air Conditioning & Heating Co., Easton, Pennsylvania, was recently named winner of Testo’s $6,000 “Ultimate Contractor Collection Giveaway”. Mr. Dech won several valuable contractor instruments including a testo 875i Thermal Imager, a testo 570 Digital Refrigeration System Analyzer, a testo 435 HVAC Performance Test Kit and a testo 320 Combustion Analyzer. Mr. Dech was presented his prize winnings by Kevin Lesnewski, Thermal Imaging Product Manager, Testo Inc., Sparta, NJ. Testo recognizes the need for rugged and reliable test instruments and is dedicated to delivering the best test and measurement instruments in the world today. Mr. Dech, surprised and pleased to be the Giveaway winner, stated “These tools will be very useful on a daily basis in the operation of my HVAC contractor business and will allow me to be more efficient”. Mr. Dech heard about the “Ultimate Contractor Collection Giveaway” at his local Johnstone Supply (johnstonesupply.com) in Easton, PA.
Testo, Inc. develops and manufacturers handheld test and measurement instrumentation for numerous markets including HVAC/R, Emission Monitoring, Food, Pharmaceuticals, Energy, Life Sciences and many other industries. Additionally, Testo is recognized as a leading global manufacturer of portable combustion efficiency and air emission analyzers, temperature, pressure, moisture, and thermal imaging instruments. Backed by over 50 years of measuring engineering experience and expertise, Testo’s mission is to provide the best quality, service and value in test and measurement instrumentation.